Located in the center of Nhon Trach, Dong Nai, the SwanPark project has many convenient transportation options as well as bring attractive utility. So what kind of investment will the project fit? SwanPark has a total area of ​​941.5 ha. In the first phase, the investor introduced SwanPark The Garden Town area of ​​94 ha, 710 houses including townhouses, villas, shophouse. SwanPark is a product of SwanCity. 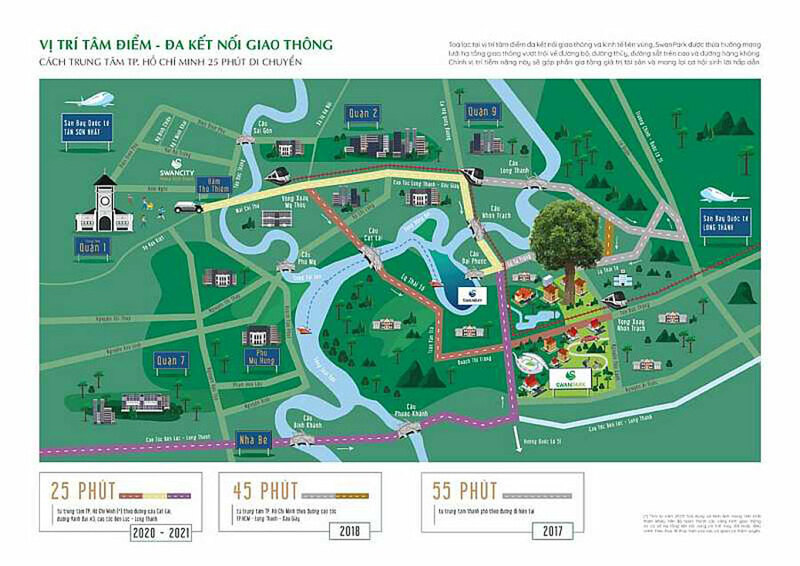 Located on 7 Sai Gon East urban area, Long Tan commune, the center of Nhon Trach district. Infrastructure is improving every day. 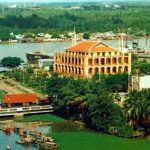 In addition, the residents easily move to District 1, District 2, District 7, District 9, Nha Be, Ba Ria – Vung Tau, Long An … The project is located between two strategic highways is a high speed. Ho Chi Minh City – Long Thanh – Dau Giay expressway and Ben Luc – Long Thanh expressway. In addition, the project is located between three large ports such as Dong Nai, Cai Mep, Cat Lai, only 5km from Nhon Trach Industrial Park. – The North connects to Belt 3 Road, District 9 and Thu Dau Mot Town (Binh Duong). – The West: adjacent to District 2, District 7, Nha Be, connecting the western provinces along the Ben Luc – Nhon Trach – Long Thanh expressway. – The South is Can Gio, Vung Tau. – The East is bordered by Bien Hoa (Dong Nai) and Long Thanh International Airport. With more and better transportation infrastructure and more transportation options. 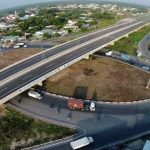 The residents of Cat Lai Bridge, Ring Road No.3, Ben Luc – Long Thanh Expressway will soon be able to move to the center of Ho Chi Minh City, which takes about 25 minutes. From SwanPark, residents move to nearby areas, downtown is convenient. 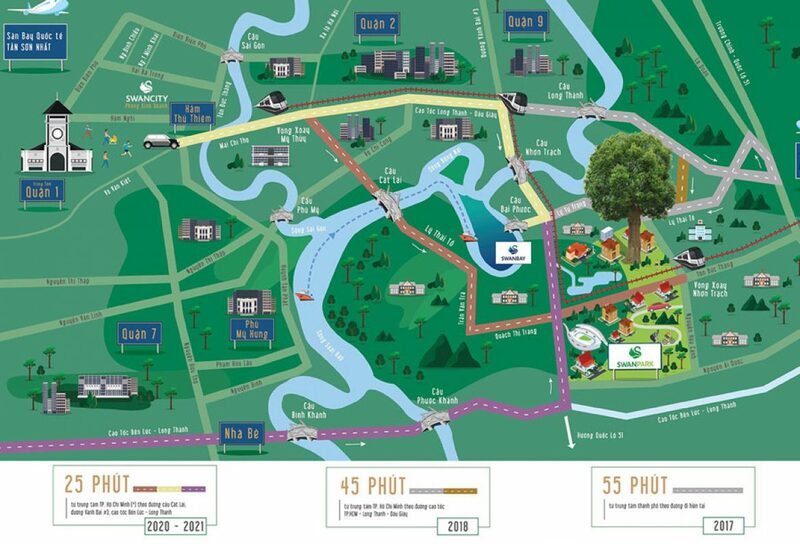 According to the Saigon – Long Thanh – Dau Giay expressway, residents easily connect Long Thanh, District 2, District 9, downtown in 45 minutes. Currently, from the city center moving along the highway Ho Chi Minh City – Long Thanh – Dau Giay to project 45 ‘. In the future, when Ring Road 3 finishes, from the center along the Cat Lai Bridge, Ring Road 3, Ben Luc – Long Thanh Expressway takes only 25 minutes. 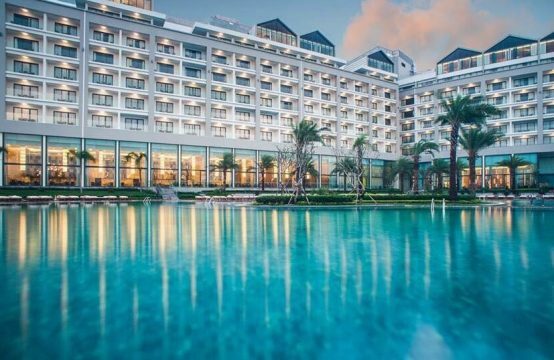 SwanCity investor from early development orientation for the project SwanPark is a product of high-end resort real estate in the East Saigon area. According to the statistics of sales reports from the investor, the purchasing power as well as the transfer of SwanPark project are good. 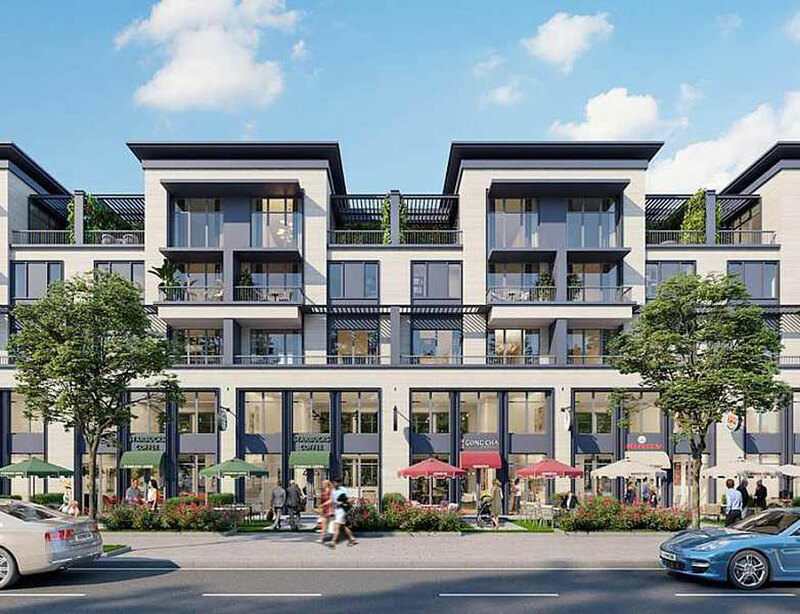 As well as other prominent real estate projects in the market, SwanPark’s developer of the project is also orienting itself from the beginning of the project to the customer. For SwanPark, buyers will be the ones who directly benefit from the quality of their products. Swan Park Project is a real estate project so the product will be devoted from the quality of life to the quality of life outside. 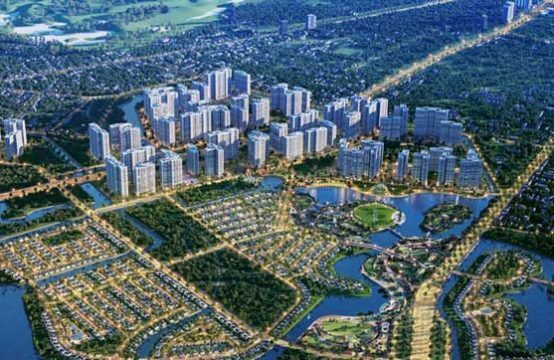 SwanPark is a green city of Vietnam with over 190ha of green area and water surface. Average green area index for residents up to 30sqm / person, 5sqm – 10sqm / person higher than the standard of the new city in the world. Perspective SwanPark villas can see the owner attaches much green space around the house. Modern architectural design when all spaces are out to welcome natural light and blend into the space of the project. A private life is independent green space next to bring standards. 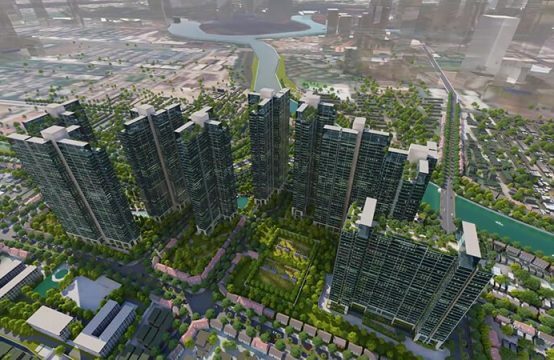 In addition, the project owns internal and external facilities to serve daily needs such as sports and play area for children, interactive area with nature, system of 16 international standards , community space, shophouse, swimming pool, picnic and BBQ, retail store, Four Seasons Park and Tropical Park. If there is no need to move to the city, life in SwanPark ensures the full supply of living needs of residents. Customers looking for a private, comfortable and quality environment should not miss SwanPark. SwanPark owns a location that attracts the number of clients who want to rent to stay relatively high when it is near the project is an industrial park, modern school. SwanPark’s clients will be financially independent as well as in need of private living space. The local and out-of-town facilities at SwanPark provide a comfortable living experience for the residents. The trend now many people want to find rent places to be able to rest at the weekend family, relatives but not moving too far. With existing local and out-of-town facilities, SwanPark is an attractive location for this facility. The project is located between three large ports such as Dong Nai, Cai Mep, Cat Lai, just 5km from Nhon Trach Industrial Park. This creates a price rebound for venture capitalists ahead of time. How to move to SwanPark. In the future, when the Ben Luc – Long Thanh expressway is completed in 2020, the belt of 3 sections of My Phuoc – Tan Van – Nhon Trach, Cat Lai and Long Thanh International Airport will operate and create a complete infrastructure for SwanPark. Demand for quality living products, far from the busy market town is still great. Therefore, SwanPark will be a potential project when the selling price from the owner is quite good, but the difference when reselling is equally potential. With the limit on the number of products as well as the actual needs of the market, SwanPark project products are suitable for you to invest in surfing potential profits. Some customers are interested in SwanPark products at high levels of liquidity. This is the foundation when SwanPark products are marketed as quality products from living space to the design as well as facilities that the project brings to the residents here. Notably, the transfer price will be improved as soon as the infrastructure of the district is completed as well as increasing market demand. While the potential of the project is clear, new investors should also consider carefully to avoid risk. Where to look for a reputable brokerage firm, providing objective information is a way to minimize the risk when investing for the first time. Among the brokerage firms that have received a lot of interest from current clients are Realestatevietnam Property Technologies. The consultant team of Realestatevietnam understands the project, follows the project from the first day so there will be insights into the depth and breadth of the project. 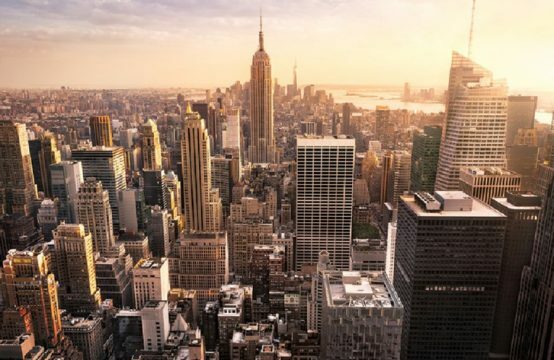 The company applies technology in real estate investment and pledges to accompany customers from the time of demand until the end of the transaction. This will be an advantage for first time investors as well as professional investors who are more confident with their investment choices. 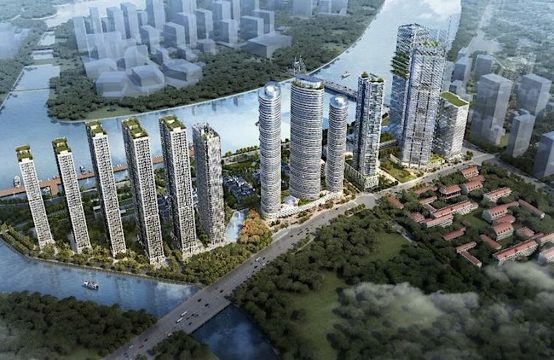 You are reading the article How to invest in suiting with SwanPark in the Real Estate category at https://realestatevietnam.com.vn/. Any information sharing, feedback please contact through Hotline 0909890897 (24/7) or email to info@realestatevietnam.com.vn. 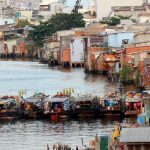 Relocating 10 ports on Saigon River: How will Nha Rong be planned?